Introducing humor through displaying Funny Safety Signs can improve safety numbers and reduce accidents. We use to have the standard safety signs mounted throughout our building, but since we switched to the funny safety signs, accidents have diminished substantially. Work doesn’t always need to be serious. In fact, successful entrepreneurs entertain the concept of putting a little fun in the workplace. Yes, safety is serious business but when humor is added to the equation, safety can become more noticeable to the average worker. Creative Safety Supply understands and promotes safety as a critical component to any business and is now offering Funny Safety Signs that will catch the attention of workers and visitors. 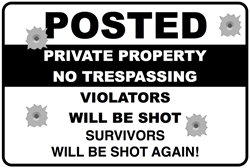 One of Creative Safety Supply’s most popular funny sign is the one about posting for private property – no trespassing. The sign goes on to say that violators will be shot; survivors will be shot again. Someone reading this sign knows not to go beyond the point where they are standing and if they were to go beyond and actually trespass, the penalty could be severe. The sign makes it clear to not enter but at the same time displays a little humor. A sign like this could be displayed in an industrial facility where hazardous material is stored or it could be displayed on the outside door of an electrical utility room. Funny safety and warning signs are all made of industrial grade durable material that can be displayed indoors or outdoors. The easy and simple peel-n-stick application will adhere to concrete, floors, walls, or just about anywhere. Wall mountable versions on plastic sign stock are also available through Creative Safety Supply. Three sizes are available in 12, 18, or 24 inch. Custom signs can be made at no extra charge. For more information about Funny Safety Signs, please visit Creative Safety Supply or call toll-free (866)777-1360 and speak with a professional representative who can answer all your questions.